I read The Scar when it first came out and couldn't get through it. But when I saw this offering on the shelves and realized it was a stand-alone book, I scooped it up and decided to give it a go. Embassytown, a city of contradictions on the outskirts of the universe. Avice is an immerse, a traveler on the immer, the sea of space and time below the everyday, now returned to her birth planet. Here on Arieka, Humans are not the only intelligent life, and Avice has a rare bond with the natives, the enigmatic Hosts -- who cannot lie. Only a tiny cadre of unique human Ambassadors can speak Language, and connect the two communities. But an unimaginable new arrival has come to Embassytown. And when this Ambassador speaks, everything changes. By coincidence, I've recently read a number of books where aliens feature, so I was intrigued to see how Mieville would go about depicting 'other'. It is a huge challenge, both imaginatively and technically to write convincingly about another species that has never been seen on our home planet. No problem for Mieville, though. He nails it. The book is written in first person viewpoint and early on it is apparent that Avice is post-human in many ways. While there are enough differences that mark her apart from you and me, she still retains sufficient humanity that I cared about her all the way through. Which is a tricky balancing act to pull off. I have enjoyed the worlds created by the likes of Iain M. Banks and Alastair Reynolds, however their protagonists are so altered by the span of time and technology that I find it difficult to really care about them. Not so Avice. But Mieville's feat in producing a sympathetic far-future human becomes a sideshow when we encounter the Hosts, the planet's indigenous intelligent species. Humans perch in a small enclave -- Embassytown, which has been biorigged to produce a breathable atmosphere for its inhabitants. Avice was born and raised in Embassytown and is only one of a handful who manage to leave the planet, due to her talents as an immerse. The Hosts speak a Language where emotion and meaning are inextricably linked. Therefore they cannot lie, and when they communicate with humans, it takes a fully bonded pair, mostly identical twins, who are raised to be able to think and talk in tandem. These pairs are the Ambassadors, who interact with the Hosts to keep Embassytown supplied with food and resources, as well as administering the industrial links between both species. Despite being a small, far-flung outpost, the planet Arieka has a thriving trade exporting some of the vital biomes manufactured by the Hosts. Avice also has another claim to fame -- as a small child, she gets involved in an incident with the Hosts where she becomes part of their elaborate Language rituals as a simile. She narrates this event with the same affectionate impatience she displays towards Embassytown, a relatively small community that she cannot wait to leave. And the only reason she returns is as a favor to her husband, Scile, who is a linguist and desperate to make his career publishing the definitive work on the Host's Language system. One of the main themes of the book is communication, which is explored on all sorts of levels. Obviously, given there is an alien species at the heart of the narrative with a very unusual approach to language, there are questions about why you'd communicate in the first place, how you create sufficient mutual understanding so that a particular words represents the same meaning by both species. What is language, anyway? But Avice also finds it a challenge to sustain the initially close relationship she has with her husband and her lovers. 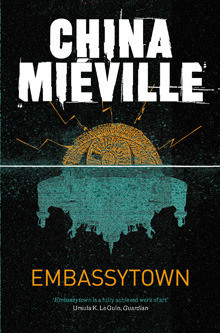 Mieville also examines the issue of power throughout the story. Who has it, who wants it and what lengths they'll go to get it. I'm conscious that I've managed to make this sound like some dry, rather worthy tome -- and it's nothing of the sort. While being brain-achingly clever and leaving me buzzing about all sorts of concepts around communication and language that hadn't occurred to me before, it is also a cracking good read. The twists and turns in the story had me exclaiming aloud and I have no hesitation whatsoever in announcing that Embassytown isn't just one of my outstanding reads of the year, it is one of those books that has both entertained and entranced me. If you're a science fiction fan on any level, go and track down this remarkable book. It's an exciting, wonderful read and demonstrates why this is my very favorite genre. What about you -- have you read anything recently that blew you away with its stunning excellence and quality?